The videos are a samples of the work Lou Rera has writen, produced and directed. 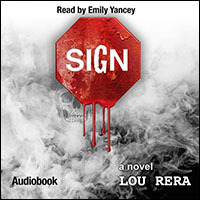 The book trailer for SIGN was written and produced by Lou Rera and directed by Joe Blodgett. The short film, Maxed Out was written and driected by Jeffrey Hirschberg and co-produced by Lou Rera. Lou served as Line Producer for Maxed Out. The Carnaval Barker was a film news promo produced by Lou Rera and James Gillan, Directed by Michael Matthews.